Prolonged exposure to harmful rays of the sun can affect the skin, causing 'SKINSTRESS'. This exposure may also result in skin problems such as premature ageing, sun marks, dullness and tanning. 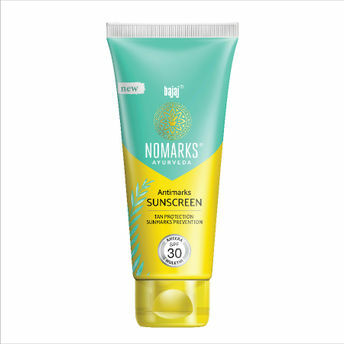 Bajaj Nomarks Ayurveda Antimarks Sunscreen, available in SPF 50 and SPF 30 PA+++ UVA-UVB, protects your skin from tanning and sun marks such as dark spots due to sun and sunburn. This dermatologically tested Ayurvedic sunscreen is suitable for all skin types. Step 1: Soothing: Bajaj Nomarks Ayurveda Antimarks Sunscreen contains aloe vera which is known for its soothing and cooling properties. It helps protect the skin from harmful sun rays. This sunscreen also contains kheera known to enhance complexion and add glow to your skin. It has soothing, antioxidant and anti-inflammatory properties. Step 2: Prevention: Bajaj Nomarks Ayurveda Antimarks Sunscreen contains mulethi that helps to reduce marks on the skin. This sunscreen also contains green tea extract which is rich in antioxidants. Wheat germ oil present in this sunscreen helps in protecting the skin from the sun's harmful UV rays. Ayurvedic Proprietary Medicine | Suitable for all skin types | Dermatologically tested. About the Brand: Nomarks is a popular skin care brand from Bajaj Consumer Care Ltd. Nomarks believes in a natural, non-toxic approach towards skincare. Hence, it has come up with a range of powerful skin care products that combine ancient wisdom of Ayurveda along with the advanced technology of modern science. These products are specially designed to revitalise your skin from SKINSTRESS that causes marks and blemishes on skin. All products from Nomarks are enriched with natural ingredients that are known to have exceptional skin benefits. Alternatively, you can also find many more products from the Bajaj Nomarks Ayurveda Antimarks Sunscreen SPF 30 range.